Destinations was the first advertisement commissioned to us by Rafineri agency. Originally planned as a simple 2.5D animation, the project was soon moved into a 3D format to enhance the feeling of flight and the depth of the world we constructed. 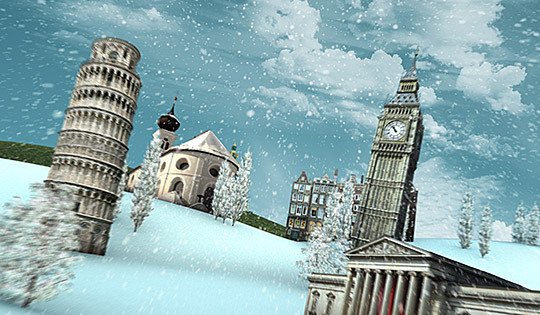 We placed flat photographic images of world's famous landmarks in a 3D landscape divided into four sections - representing the four seasons. Bulk of the project was rendered using Cinema 4D. Particles, sky and other extra elements were then constructed and composited in After Effects. The ad was produced in both Cinema (2K 16:9) and TV (PAL 4:3) formats.